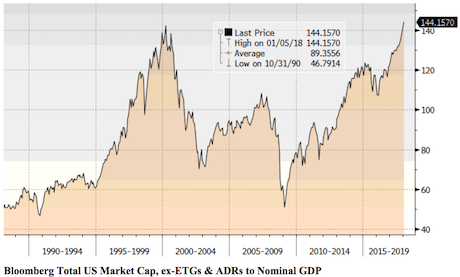 The market is now officially in the largest bubble relative to the economy in history according to the stock market capitalization to GDP ratio, which, incidentally, is Warren Buffett’s favorite means of valuing stock. While some pundits may point to the economy or the Trump economic agenda for this move, the reality is that everything the markets have done since 2008 has been driven by the Fed creating a bubble in US sovereign bonds, also called Treasuries, and because these yields represent “the risk-free rate of return” for the entire financial system ALL risk, including stocks, adjusted accordingly. …I am growing increasingly concerned about…what’s coming…We’re currently in “late 2007” for the coming crisis. The time to prepare for this is NOW before the carnage hits. …2017 provided many good times [but,] for worriers, the low volatility and steady gains of last year signal bad times are likely in 2018…[and] they have a point. It’s true that good times can’t last forever. [That being said,] it’s also true that we can spot when the good times have gone too far with this simple indicator. 2. Will Similarities Between Trump & Kennedy Rallies Continue & Conclude In A Market “Slide” In Early 2018? Right now most people seem to have been lulled into a false sense of security, and they truly believe that everything is going to be okay but every time before when the market has looked like this, a crash has always followed, and this time will be no exception. Valuations and sentiment play into future stock market returns…as valuations indicate what people are willing to pay for a dollar of earnings. During times of exuberance, investors overpay for earnings and, during times of fear, investors underpay for earnings. Currently, two measures of sentiment are sending cautionary signals that 2018 may not be as strong of a year. The U.S. stock market has entered into the last stage, which I call the Super-Charged Tulip Mania. Not only are stock prices inflated well above anything we have ever seen before, but valuations are also reaching heights that are totally unsustainable. This next market crash will not resemble anything similar to what took place during the 2008-2009 U.S. banking and housing market collapse. When the markets cracked in 2008, EVERYTHING went down together. Instead this time around, as the markets tank the precious metals will surge to new highs. 11. Is the Dow About To ‘melt-up’ to 45,000 or 50,000 – Or About to Crash? Many people think that a huge crash is coming within the next 18 months. That being said, there are those who think that we will have a major ‘melt-up’ to 45,000 or 50,000 prior to a historical crash. Personally, I am uncertain which it will be and am waiting to discern what our Central Banks will do! Here’s why. There has been nothing that has been normal about this economic recovery, and I don’t think there’s going to be anything that’s normal on how this all ends. For now, enjoy the melt-up, because this too will come to an end.